After a decade of planning, designing and building, the Florida State University-based National High Magnetic Field Laboratory now has the strongest magnet in the world for nuclear magnetic resonance (NMR) spectroscopy, a powerful technique used to study molecular structures in proteins and materials. 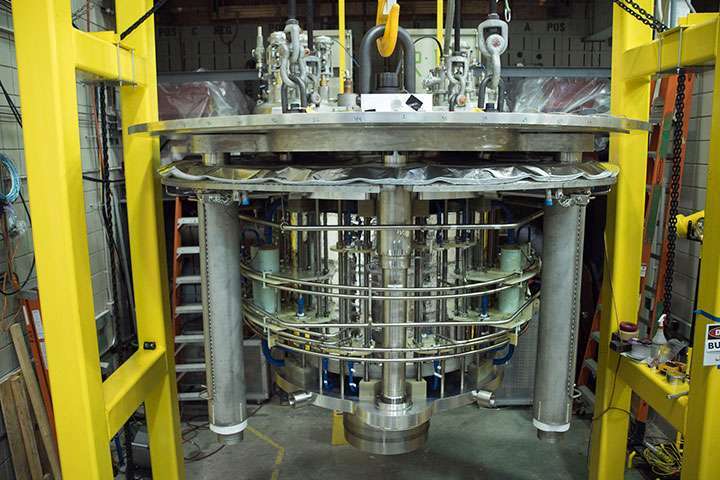 The 33-ton engineering marvel, called the series connected hybrid (SCH) magnet, successfully broke the record this week during a series of tests conducted by MagLab engineers and scientists. The instrument reached its full field of 36 tesla Tuesday afternoon. Tesla is a unit of magnetic field strength. For example, a strong refrigerator magnet is .01 tesla, and a typical MRI machine is 1.5 to 3 tesla. The milestone busts open a door to discovery, making the highest magnetic fields available not only to physicists but, for the first time, to biologists and chemists as well. It was the culmination of 10 years, more than 120,000 person-hours and $18.7 million from the National Science Foundation and the state of Florida. "This achievement reflects a tremendous amount of technology development," said Director of Magnet Science and Technology Mark Bird. Bird, who has overseen 20 unique magnet projects at the lab, called the SCH "one of the most complicated magnets ever built at the MagLab, a testament to a great team working with great determination." What makes the SCH unique is that it can create a very high magnetic field that is also of very high quality. For magnets, quality means a field that remains constant over both the time it takes to run an experiment and the space in which the experiment takes place in the magnet. Unlike most of the physics research done in magnets, NMR requires fields that are very stable and homogeneous. At 36 tesla, the SCH is more than 40 percent stronger than the previous world-record NMR magnet (the MagLab's Keck magnet) and more than 50 percent more powerful than the highest field high-resolution NMR magnet, a 23.5 tesla system in Lyon, France. In NMR, scientists use magnets and radio waves to locate a specific element (commonly hydrogen) in proteins and other samples, which helps them figure out those complex structures. A powerful technique in health research, scientists use it, for example, to pinpoint a virus' vulnerability to drugs. Existing NMR magnets are limited to locating just a handful of elements, notably hydrogen, carbon and nitrogen. The SCH's 36-tesla field could revolutionize NMR because it significantly boosts the instrument's sensitivity, expanding the menu of elements scientists can see. "There's going to be a real increase in the reach of NMR into the periodic table," said Tim Cross, who oversees NMR research at the MagLab's FSU headquarters. "So we're going to be able to look at many more elements than we've really been able to in the past." Zinc, copper, aluminum, nickel and gadolinium—all of interest for battery and other materials research—will now be observable using the SCH. But for most biologists, the real prize will be oxygen. "Oxygen is where so much biological chemistry takes place," Cross said, "and until the SCH, we've just not been able to look at it." 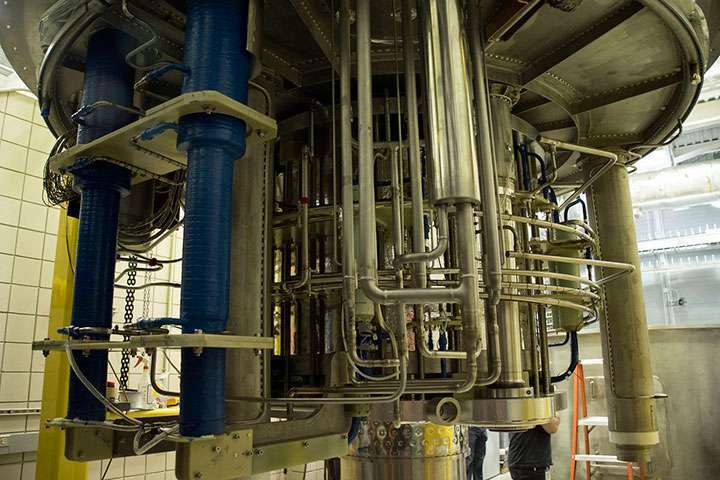 The new magnet will also allow researchers to vary the field strength and switch relatively easily from examining one element in a sample to another, which will help them to collect more and better data.